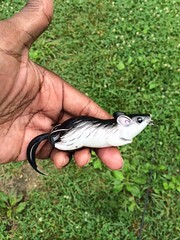 A lure constructed by winding natural or synthetic material such as feathers, fur, hair, tinsel, thread, fiber, wire, plastic, cork, or rubber on or around the hook, and designed to be cast by means of a fly rod. The following are considered artificial lures: spinners, spoons, plugs and molded facsimiles of worms, insects and fish. For the purposes of these regulations, artificial flies and streamers are considered to be artificial lures. Natural attractant added to a hook to catch fish. bait includes live and dead baitfish, crabs, crayfish, worms, eels, insects, mussels, clams, cut bait (fish), chicken livers, corn kernels, dough balls, squid, and shrimp. A weighted, fish-shaped blade made with a swinging hook and designed for fishing deep. Refers to both largemouth and smallmouth bass. These "safety pin" wire lures for surface fishing have a propeller blade on one wire and a weighted body, skirt and hook on the other. A spoon-shaped metal or hard plastic lure that wobbles to attract fish. They can be fitted with a fixed (solid) hook or swinging hook, that has a single, double or treble points. Catch means to take, kill, trap, gather, harvest or in any manner reduce any fish to personal possession. 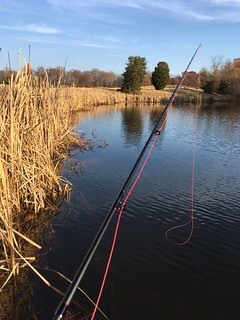 A fishing technique by which bait or scent is released into the water to attract fish to take a lure or baited hook. Chum consists of live, dead, ground-up or prepared baits and scents and is used in fresh and saltwater. A type of fish hook which is sharply curved back in a circular shape. It has become widely used among anglers in recent years because the hook generally catches more fish and is rarely swallowed. A fish-like hard lure or plug designed to swim under the surface, often made of plastic or wood. Some are combined with replaceable soft plastic tails. After being in possession of a fish, to discard or exchange that fish to possess another fish of the same species. Daily creel is the number of fish that an angler can keep after a single day of fishing. The U.S. Exclusive Economic Zone is where the U.S. federal government has jurisdiction over natural resources it begins at 3 nautical miles and extends to 200 nautical miles from the Maryland coast. Also called a "bobber", these suspend hooked bait off of the bottom, and signal hits by "bobbing" when a fish takes the bait. A metal wire device most commonly shaped like a "J" with an opening or "eye" at one end to which the line is tied and a point at the other end to catch the fish. Circle hooks have an angled point. Double and treble hooks have two or three points, respectively. 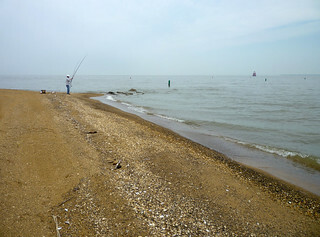 A trolling lure made out of long sections of surgical tubing, used for striped bass and bluefish in the Chesapeake Bay, also known as "surgical hose" or "surge tubes". A catch of related fish species counted together. Sometimes called "bucktails", these weighted-body (often lead) lures are molded on special hooks and rigged with a hair tail or soft plastic skirt or worm. A method of dropping a lure into the water over a fishing site and moving it - "jigging it" - up and down to attract fish. Done from a pier or boat. A length of monofilament, wire or other stranded material tied between the end of the line and the lure or hook. Leaders provide extra strength or abrasion resistance from the rough mouth and teeth of fish (pike, barracuda, sharks), scales (sharks), gill covers (tarpon and snook), blows from tails (tuna). Using a live finfish on a hook for the purpose of catching other fish with hook and line, rod and reel, or handlines. Something large of its kind. This term is used especially when referring to large game fish. Any artificial item designed to attract fish and fitted with hooks. These include flies, hard plastic or wood lures (or plugs), soft plastic imitations, large offshore skirted baits, metal spoons, lead-head lures (jigs), bladed lures, spinners, spinnerbaits. Popping plugs, or “poppers,” are saltwater fishing lures that splash across the surface, drawing a reaction bite from aggressive predators, and work best at dawn and dusk when fish are more likely to feed on the surface. Any condition where a fish is controlled with the angler's intent of ownership. Possession limit is the maximum number of fish that an angler may have in their possession after two or more days of fishing. A mechanical device for holding and spooling fishing line. Reels have a line spool, brake to slow running fish, handle to retrieve line and foot for clamping to a rod. Reel styles include CASTING (revolving spool), SPINNING (line coiling off stationary spool); SPINCAST, (like spinning but with a nose cone), and FLY (storing thick fly line/backing and to fight big fish). A long lever, usually made of fiberglass, graphite or composite materials and used to catch fish. Different types are available, such as rods for spinning, fly fishing, spincast, bait casting, boat fishing offshore trolling, surf fishing, jetty/pier fishing, etc. Most rods have a reel-holding clamp and guides through which the line runs. This jellyfish species can be identified by an opaque white bell and long, trailing tentacles which carry a painful sting for swimmers and waders alike. 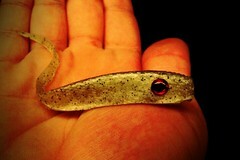 A weight of lead or other metals designed to sink a hooked bait or lure. A small device similar to a dog leash snap, tied to the line and used for attachment and quick release of hooks, rigs and lures. 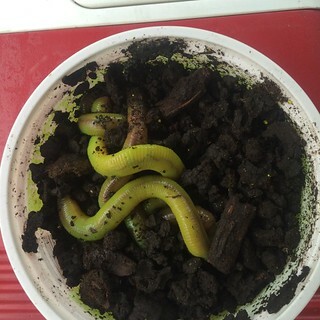 Made of a soft plastic to resemble a worm, lizard, crayfish, shrimp or generic wiggling creature. Often sold in bulk to be rigged on hooks by the angler. Spinner blades rotate around the straight wire shaft of these weighted-body treble-hook lures. "Safety pin" style wire lures with one or more spinner blades on the end of one wire, and a weighted body, skirt and hook on the other. Used to fish around structure such as trees and stumps. Fishing without moving the bait once it is cast with replaceable soft plastic tails. A hook which trails another hook or hook unit, either by direct physical attachment to the lead hook or hook unit, or by a connective device such as a line, swivel or chain, and is part of the same bait or lure. Any "hit" by a fish taking a lure or bait. a wet fly that imitates a small baitfish that larger fish feed on. There are many streamer baitfish imitations that will catch fish in lakes, streams, ponds and in saltwater. One of which is the Wooly Bugger​. Both casting and vertical jigging techniques are used for fishing these swinging hook heavy metal lures. A small device with two or more eyes (rings) a central swiveling part. 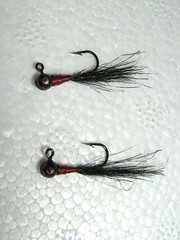 They are used between a lure or leader and line to prevent line twist. Otherwise, line twist can occur when a revolving lure twists line to cause tangles. A box or bag with special compartments and features to hold terminal tackle, lures, hooks, and other fishing gear. A general term for describing bobbers, sinkers, hooks, rigs, snaps, swivels and other gear used at the end of a line. Lures made of hard plastic, wood, hollow rubber/plastic and designed to float on the surface to attract fish when twitched or moved. A fishhook where three hooks share a single shank, each point separated by 120º. A method of slowly running a boat while trailing lures or bait. This fishing method is used to cover a lot of water and to find fish. 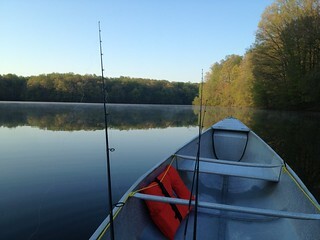 A large spoon that is trailed, or trolled, behind a boat to catch fish. Made of soft plastic, these tubular lures are fished with special weighted hooks inserted into the hollow body. Wobbling spoons made with a fixed hook and guard for fishing weeds.